My clever hubby brought this for me for Christmas with no prompting or assistance. I love it. So, we have our private appointment booked for the 8th of Jan, whoop whoop! And it seems as though there is a possibility we will still be able to access some funding through the NHS if this is unsuccessful but I am unclear at the moment how much that would be and what we could use it for. I am going to try to get that clarified at my app. In theory we could be getting treatment by February. You could knock me down with a feather. Remus's bestie's second baby was born two days ago and we are in the process of processing that. I hate so much when it is hard to find the joy for others. We will get there, but it is taking time. There were no bump bombs at the cousinly and it was wonderful to see all the family. I had an immensely enjoyable time, parlor games a-go-go. Luckily the only cousin who has reproduced lives in Ireland so the get together is still an adults only event, although we all regress to childhood anyway as we grew up together. So much fun. What are all your plans for new years eve? I have none as yet and I am trying to work out what we are going to do. Love the necklace! Remus did well. Same old new year's eve plans as always, I think. Mostly spent in front of the TV. We are old and boring. We don't generally go out on new year's eve. I am not a big fan of it. I think I will just be in hiding until it turns 2013. Beautiful necklace! Glad there were no bump bombings! We don't have any amazing plans, just dinner out and drinks somewhere in town. Hope you have a great NYE! No real plans for us. It's been a quiet few days post Christmas and will likely be the same for the next few days. Remus did very well. 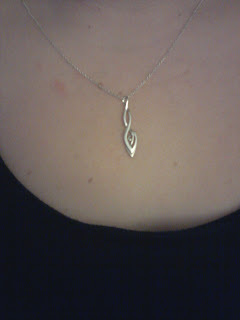 The necklace is beautiful. It is hard to process a friends success for the second time when you're still waiting for your first....Excited for your first appointment! Hoping it brings you the success you've been waiting for! New Year's plan....I'll be with the babies at work....Wishing you all the best in the new year! I'm keeping my fingers crossed that you'll be able to start treatment very soon! I think we'll probably stay in for NYE. We're completely over the holiday socializing thing after a week of endless family events. Time to veg out and relax. What a gorgeous charm! Loves it! Love the necklace! That boy did a very good job. We're doing the same as always for New Year's Eve: renting a bunch of movies and hunkering down in our PJs for 24 hours. Not super exciting, but oh-so-cozy-and-sweet. Happy New Year, love! Hoping 2013 is happy and magical for you and Remus. Oooh love the necklace!! Yay for your appt on 1/8! Woot! Happy New Year! That is so sweet, that he got you the necklace. I hope 2013 will bring you magic and fulfill our deepest wishes. For New Years Eve we were just home... after visiting friends in the afternoon. A friend of the husband came, we had small bites like cherry tomatos with mozzarella, salmon and cheese cream crackers, cheese... and homemade macarons. Bubbles and grapes of course come midnight. I hope your appointment goes well! !